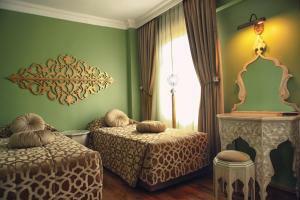 Kervan Hotel offers modern rooms with free Wi-Fi in a restored 19th century house. Its terrace offers scenic views of the Blue Mosque. Basilica Cistern is 100 metres away. All rooms have touches of traditional interior including a wooden floor and rich-coloured fabrics. 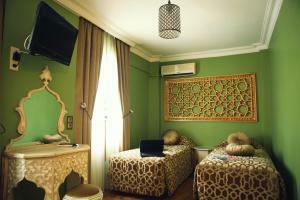 Each room is air-conditioned and fitted with goose down pillows and comforters. Guests are served a complimentary buffet breakfast which features Turkish delicacies and homemade jam in an authentic dining area. The hotel has 2 terraces; one with Hagia Sophia and Blue Mosque views; and the other one offering a panoramic view of the Bosphorus with Topkapi Palace and Galata Tower. 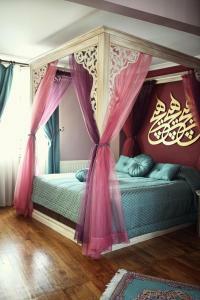 Hotel Kervan’s staff can organize trips and tours around Istanbul. It also has a gift shop specializing in local artefacts and souvenirs. 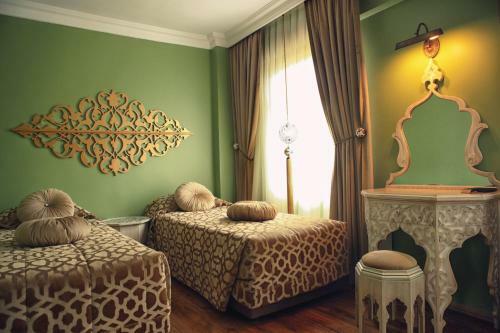 Kervan Hotel is less than a 10-minute walk away from Hagia Sophia. Topkapı Palace is 400 metres away.